I probably won't be posting again this week, as I have to go out of town, and I don't think I'll have time! I took these photos yesterday. 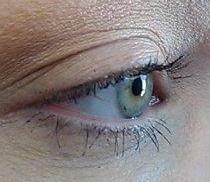 I have completed two weeks of Latisse, and I think I see some lengthening, but it could be my imagination! 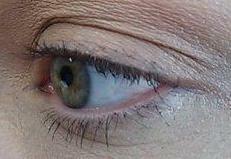 I haven't noticed any lashes falling out since I started using Latisse. I was using it on my eyebrows, the part closest to my nose, to try to fill in from overplucking. It was working, but then I noticed the skin became painful to the touch. Very, very painful. You know how it feels when you press on a HUGE blemish? That is how it felt. 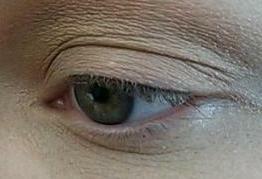 So I stopped using it on my eyebrows, and the pain went away after about two days. I think I'm going to try Rogain on them, but that is another post for another day. 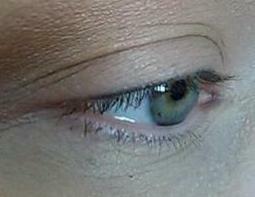 Latisse, end of week two, with mascara!! !